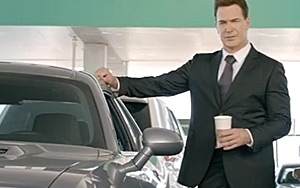 National Car Rental has hired actor Patrick Warburton to bring his unique humor to three TV spots. The actor, who previously had parts in “Seinfeld,” “The Tick” and “Rules of Engagement,” is featured in the first spot as a “control enthusiast” road warrior. He is shown maneuvering the airport and car rental lot while maintaining complete control of every single aspect. The spots provide a “comical refresh” to National’s ongoing “Go Like A Pro” campaign, which promotes the brand’s expertise in helping business travelers efficiently navigate their frequent travels. One of the company’s main goals in developing these new TV spots was to get and keep people’s attention, and humor is one of the best ways in which to do that, says Rob Connors, assistant vice president of brand marketing for National Car Rental. The media buy includes broadcast and cable television. In addition, a series of digital videos called “A Control Enthusiast’s Guide to Life,” in which Warburton shares tips on how true “control enthusiasts” handle everyday situations, will be shared across social media channels beginning next week, with new videos rolling out in the new year, Connors says. Originally launched in January 2011, National’s “Go Like A Pro” advertising campaign promotes the brand’s expertise in helping road warriors efficiently navigate their frequent travels. The creative for the campaign was developed by Cannonball Advertising and the advertisements were placed by PHD. The spots showcase National’s commitment to providing time-sensitive frequent airport travelers with unmatched control throughout their rental experience. National serves the frequent airport travelers, many of whom are on the road several times a year for business, Connors says. “These ads were designed to resonate with that audience of ‘road warriors’ who have come to expect a certain level of service and control over every aspect of their travel,” he adds.